Question: Which of the Macy’s Santas, who work in the NYC Macy’s Santaland, get to ride on Santa’s float for the Macy’s Thanksgiving Day Parade? Answer: They all do, or at least invited to. But not as Santa Claus. One of the many costumed or uncostumed characters who ride on, or accompany, the World’s Most Famous Parade Float. This was to be my fourth year returning as a Macy’s Santa in the Downtown Pittsburgh Store. It was late October and I still wasn’t contacted about schedules or shifts. When I finally was contacted, I was surprised to find a whole lot of changes had occurred. This year, a company called Freeze Frame had taken over the business of Santa Claus for Macy’s. Freeze Frame is mostly known for shooting photographs of people as they ride thrill rides in various American amusement parks, usually caught in some terrifying pose as the roller coaster is about to descend in it’s death-defying drop. Freeze Frame, a Florida company, made an offer that Macy’s couldn’t refuse. Freeze Frame would now completely control the Santaland photo operation in Macy’s stores in New York, Chicago, Pittsburgh and Philadelphia. Next year they will expand to San Francisco, Portland and Seattle. The idea was to brand the “Macy’s Santa” image. You could go to any Macy’s in any part of the country and see the exact same Santa that appears in the infamous Herald Square store. Truth is, I don’t think any child (or average adult) sees the difference between a Macy’s Santa, Coca-Cola Santa or any other Santa. Santa wears a red suit with a fur trim and that’s that. Freeze Frame was scrambling to get everything ready in time. Creative Costumes in NYC was contracted to manufacture Santa suits based on the Macy’s in-store Santa Suit. Real leather boots were ordered from Italy. Beard and wigsets, made of genuine yak, were ordered from Atelier-Bassi of Switzerland. A” Macy’s Santa School” was quickly thrown together and presented to myself and the three other returning Santas. This was a 45 minute video shown on a laptop. School consisted of, 1) Taking care of the Macy’s Santa Beard and Wig, 2) Taking care of the Macy’s Santa Suit. And 3) Make-up. Oh yeah, and a quick how-to about getting kids on your lap, take the picture and get them off your lap in 45 seconds or less. This part of the video was absurdly demonstrated with Santa and an adult and I’ve never seen a Santa visit go that fast in my life. It became clear that this year was going to be less about a good customer experience and more about profit. The Macy’s Suit was made of wool and unlined. It consisted of a white, poet-style shirt, and wool overhauls with the straps sewn on that fastened on the front with buttons. This was made as a “one-size fits all” that the front buttons adjusted the length of the pants. The wool coat was comfortable and cool, but where the fur attached to the suit was exposed stitching and looked as if it were made in a hurry. The leather belt/harness was very loose-fitting. The tops of the straps were held onto the coat shoulders by the military-style espadrilles that had a snap button to hold things in place. A belly pad was optional; I didn’t need one. Leather wrist straps finished off the coat. The worst thing about wearing this suit was the hat. It had four bells around the fur trim and the way that the hat sat, there was a bell directly above my left and right ear. Every time my head moved the bells would ring right in my ears. It made it difficult to hear what the kids were saying and the constant ringing in my ears gave me a headache. By the end of my shift, I could still hear those bells ringing long after I went home. I complained about it and nothing was done. After the third night, not being able to take it anymore, I got a screwdriver and when no one was looking, removed the ball bearing out of the two bells above my ears. No one noticed and nothing was ever said about it. The fact that I had a real beard created a problem. I was asked to wear the yak beard over my own and I refused. Nothing against it, but there was no way that I could comfortably attach that beard and remove it without damaging my own beard that had been carefully colored and styled for the season. They had to send pictures of me with my beard to Macy’s officials to get approval. Macy’s approved and I was able to move forward. A long-standing good reputation surely helped. I was told that I had the only real beard in the system. Freeze Frame may know a lot about taking pictures but they didn’t know much about Santa. They viewed Santa as sort of a fixture to take pictures with. You could put anybody in that red suit (even a mannequin) as long as they got the picture (and the money). I was told more than once that I was taking too long with the kids and had to get the picture immediately. A funny thing was happening. People were bringing their kids to see Santa and not buying the picture that was taken. What could be going wrong? After all, this was the famous Macy’s Santa, the same one who appears in the Macy’s Thanksgiving Day Parade and who starred in the movie, “Miracle on 34th Street”. Advertised locally as being the one and only, real Santa Claus. They were scratching their heads, puzzled in amazement. Now was the time for Freeze Frame to learn a little bit about what Santa is all about. The main reason that parents take their children to see Santa Claus is to give the kids a good, Santa experience. If I’m doing my job right, those parents will relive their own childhood when they see that their kids having a good time, and they have that special glow in their eyes. When a good experience is created, a picture is naturally wanted. People bring their children to Macy’s expecting the best possible experience. If I rush a little girl onto my lap who is even a tiny bit afraid of Santa, she will cry. If I spend a little bit of time, coupled with a little Santa magic, the child will willingly sit on my lap and smile. Also, parents will not buy a picture if their kids don’t look their best. It doesn’t matter how good Santa looks, the parents are only looking at their own child. Freeze Frame did not understand that. The fun of Santaland was gone, too. The old Santaland was on the 7th floor. There were reindeer, polar bears and other woodland creatures to look at while you were waiting in line. Santa’s throne room looked like a living room with his chair, other furniture and pictures & decorations on the wall. A nice, pleasant place, it was coupled with the Children’s Very Own Gift Shop and Macy’s Holiday Lane which was their selection of Christmas decorations. The new “Santaland” was moved to the 1st floor. It consisted of Santa’s throne and one Christmas tree located between the escalator and the perfume counter. Besides the camera equipment and cash register, that was it. It had been determined that Santa on the first floor would be more visible and generate more sales. Once again money was put ahead of the customer and the only thing generated was complaints. The season opened and the crowds were lining up to see Santa. If a typical visit to Santa is to last 45 seconds for one child, shouldn’t two children be a minute-and-a-half? The “rush ‘em on your lap rush ‘em off” approach wasn’t working. Children were crying and parents weren’t buying pictures. What could be wrong? Freeze Frame finally decided to listen to the Santas and the helpers who had been doing the job for years. It’s true, there are some kids that will go through in 45 seconds without a hitch. I try to give each child a “good” visit with Santa. That means a little fun, a little laughter, and a smile on every face. Memories are being made. The children that are scared take a little more time. But when I see a scared face turn into a happy one I know I’ve done my job. Happy kids = happy parents and sales go with that. Also, my elves like to take a little time and make sure that hair is in place, dresses are straightened and hands are placed nicely on the lap before the picture is taken. All this makes for a “good” visit with Santa and people are happy. This idea holds true today. Service sells. We even had a came up with a place where customers could put their coats and packages. Parents began buying pictures again, and Macy’s reputation for providing quality and service was intact. I was glad when Freeze Frame decided to listen. It was like when the Grinch’s heart grew three sizes that day. Pittsburgh became the store with the highest amount of sales per customer visit in the country, and I started to like working for Freeze Frame after all. I work a lot of private parties and events throughout the season, but I always have a soft spot in my heart for Macy’s and I keep coming back. It’s long hours and low pay and I use it mainly for the nights that I don’t have anything else planned. Since I became hooked on the original “Miracle on 34th Street”, I’ve always wanted to be Santa Claus for Macy’s. With me, I’m proud to wear the Macy’s suit and enjoy the magic that comes with it. Freeze Frame now hires all of the Santas, Elves, Helpers and Photographers for the Macy’s stores across the country that have Santa Claus in them, including New York City. These stores are mostly old, downtown department stores that Macy’s have taken over the past few years and want to keep the local traditions intact. They typically advertise in the Help Wanted section of your local Craig’s List starting around October. They have called back a lot of people who have worked in previous years but always have an eye open for new possibilities. They hire all races and ages but you must pass a drug test and a background check, which is done at their expense. In New York City, I’m told, they hire a lot of out-of-work actors looking for work for the season. The pay is lower than what a mall Santa makes and it is preferred that you don’t have a real beard. There is no bonus for making quota. The schedule is very flexible and the job is usually shared between several Santas. It can be very demanding at times, but still can be fun. You will experience many different types of people, both children and adults, and you’ll form memories and friendships that will last a lifetime. If you have Santa in your heart and like making children happy, you’ll find the joy of working at Macy’s. I know I did. Great Posting. Very informative. Thanks for sharing your experiences with us. Very interesting. Great blog, thanks Santa JohnnyBoy. I'm going to share this with my local Santas next weekend at our lunch. 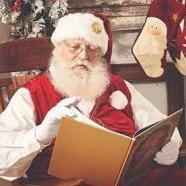 Very nice story!By the way, some Mall Santa's faced with huge lines have to move the lines too,it's not unusual for some time to be quicker then say when the lines are slower! For the Santa that is actually on the float in the parade, do they audition actors for this? An interesting read, thank you for posting. OK so this was posted well B/4 my time in getting here, so very glad I found it as well as took the time to read it. This was quite a while back but I learned a lot from working at Macy's. Macy's has since closed their downtown Pittsburgh store and therefore the Santa photo operation. At one time there were several Macy's Santalands in major cities across the country. I wonder how many are left? I recall reading that the one in Portland was closed down a few years ago as well. They never had one in Hawaii. Though the Lehigh Valley Mall had a Macy's Department store in it, (this was in the 80's) they never had the Santa Land nor even a Santa. I am guessing that was because of the Lehigh Valley Mall had a huge display front and center lower level of the mall that went up to the second floor. This is ALL guess work on my part, I was only a teenager and I was too young to care about those things back then. The Lehigh Valley Mall Santa's never looked as good as the Hess Brothers Department store in center city Allentown. I believe that Portland closed and St Louis, too. Wonder if there any left outside of NYC? We still have a fairly large Macy's here in Columbia, although the downtown location moved to anchor a nearby mall. No Santa land though...they have a mall Santa outside their entrance.